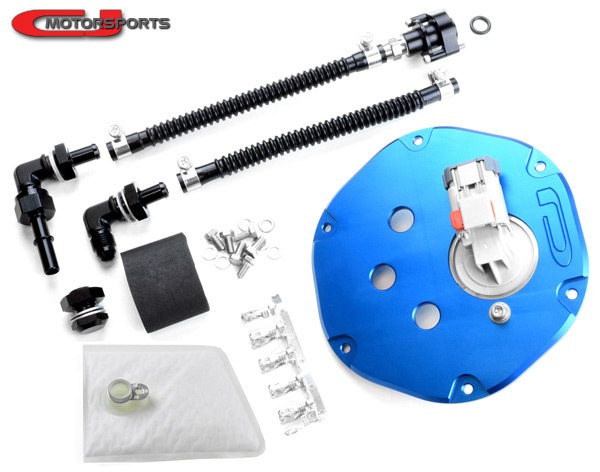 For those who wish to build a custom return fuel system, CJ Motorsports offers this return fuel pump modification hardware package. Starting with our billet hat for the fuel pump module, rigidity and reliability is addressed along with larger wiring terminals to support upgraded fuel pumps. This kit follows our "Level 2" standard of plumbing for the return conversion and bypasses the internal fuel filter. A PTFE hose will lead from your fuel pump to the 6AN output bulkhead. A fuel pump support sleeve and fuel pump strainer is included to eliminate the need for purchasing a fuel pump installation kit. Add an optional fuel pump in the drop-down menus to complete the package. Return plumbing is also through a 6AN bulkhead, then a 3/8" PTFE hose, and into our billet regulator delete fitting assembly. The supplied QD/6AN adapter can be used to connect either bulkhead to the stock fuel feed line. We suggest using the stock feed line as the return, and running a larger feed line with external filter underneath the vehicle. Proper return conversion maintains important venturi pump system functionality. Fuel Pump: Include a fuel pump to complete the in-tank package. Relay Kit: Add our optional DeatschWerks wiring kit if you are still running your factory fuel pump wiring. The power cable is 12ga and 15' long. It includes a 25-amp inline fuse and a 40amp relay and socket. Fuel Pump Output Size: Since this product includes a PTFE hose that attaches directly to the fuel pump, we need to know which fuel pump you are using in order to determine which size fuel pump hose to include in your kit. Select 8mm for most popular pumps such as the Walbro 255, AEM 300, Aeromotive 340, or other pumps that emulate the Walbro 255 in physical dimensions. Select 10mm for the Walbro 450 or Walbro 400 pumps. Dual Spring Upgrade: Later 370z fuel pump modules added a second spring to equalize the downward force on the canister to reduce warping. Our billet top will not suffer from warping, but the dual springs still add rigidity to the installed assembly. With this option, 2 springs and stainless spring seats (washers) are included, and the factory spring is no longer used. If your module is already dual spring, this option is redundant.